Our Siamese cat Pizzicata passed away in May 2016.
until she too died after being spayed November 2016. Sita remains alone and is gradually finding a few of us worth snuggling, sometimes. Their "Teaching" Video on YouTube !? 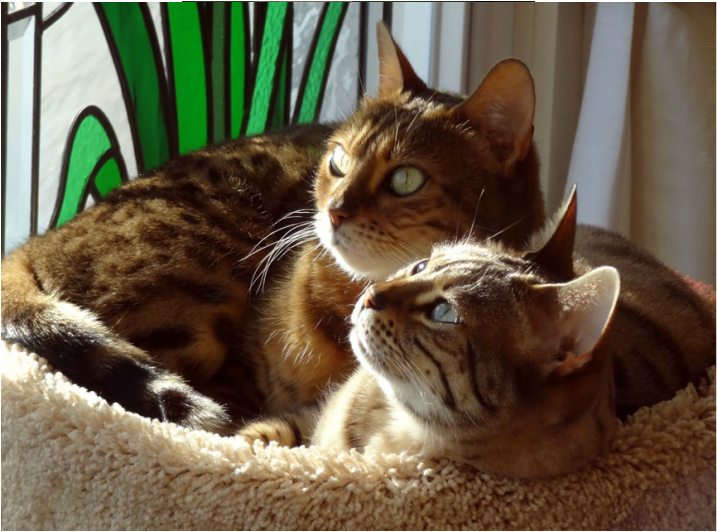 Five year old Bengal cats when we got them from the PEI Humane Society in December 2013.
but then decided Dewi and Sita would be more dignified for these beauties. In Hindu tradition, Dewi means "goddess"
and Sita is the heroine goddess-wife in the Ramayana. Dewi died Dec 2014. Sita is our only cat now.